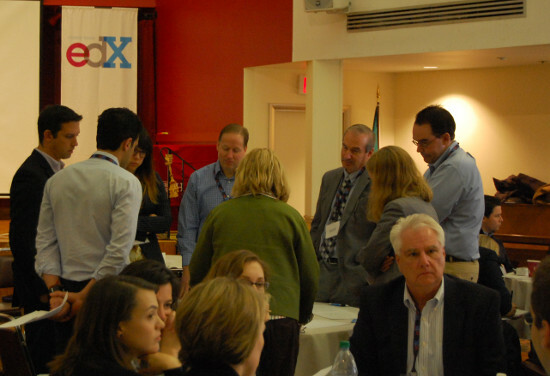 In December 2013 the State Department hosted alongside with Harvard, MIT and edX a meeting to propose ideas for using technology to improve the current state of higher education. This turned out to be the first ever Open conference, named edX Datajam 2013. The open edx community was invited to take part in this event, and eduNEXT, committed to the development and evolution of the project, participated. The event was held in the EDX offices in Cambridge and in the nearby center Dante Alighieri. We had the chance to meet with representatives of academic institutions such as Harvard, MIT, Georgetown, and Stanford universities, the US government (the White House and the US Education Department) and also with representatives of private companies. After the introductions, and some presentations by EDX in which they unveiled their latest ideas in technology for e-learning, we put hands to work and for a few hours worked in proposing and refining ideas to solve the key problems of the current higher education and online education. Students Have little knowledge of what it means financially to enroll in a high ed institution and good advice is scarce. In Online education teachers has very little feedback on the outcome and quality of their classes. The Students taking online courses feel little interaction with their peers, which isolates them and prevents networking. To prepare educational resources for online education requires a great amount of work which could be reused if there were better has spaces for sharing information. Later on, each group posed a possible solution to one or more of these problems and then the groups with technical capacity, met for over 14 hours of hackathon, to try and code prototypes that would give life to some of these ideas. I had the chance to work collaboratively with other developers in a track called “Hacking Analytics and Interactives” aimed to explore and use the APIs to build rich interactive pluggable components within the edX stack, specifically, in building the first version of “Social Scribble”. Micro-Scribble, is an initiative that allows students in online courses to make notes about the course content which will then be shared to other students, so that when each user does an activity like watching a video, he gets a chance to share ideas and discuss the contents with other participants flexibly and quickly without losing the context of the content by having to move to a different area of ​​the course such as the discussion forums. This hackathon project was made collaboratively by some wonderful and brilliant people from edX, Harvard University, Georgetown and the opensource community. Thanks to the efforts of all participants in the team, “Social Scribble” was presented at the end of the Hackathon, the first prototype was functional enough to make notes on a video component in the current edX platform. This first Open edX event, in which eduNEXT participated actively, was a very interesting opportunity to get a first recognition of other institutions and teams working with the Open edX platform worldwide.